The Dying Gaul or Dying Gladiator is depicted in his final moments next to his shield and sword, his face in pain with a fatal wound to his torso. The original marble figure which is found in the Capitoline Museum in Rome is a Roman copy of a Greek sculpture thought to have been in bronze. This is a good example of serpentine carving probably from The Grand Tour. The verde Prato serpentine has been quarried for centuries near to Prato, northwest of Florence in Italy and the stone is so named due to the resemblance to the skin of a serpent. 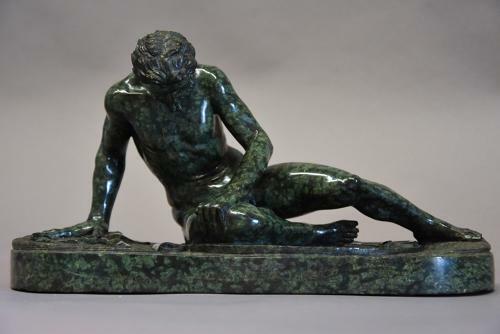 This sculpture is in excellent condition for age and can go straight into a home.